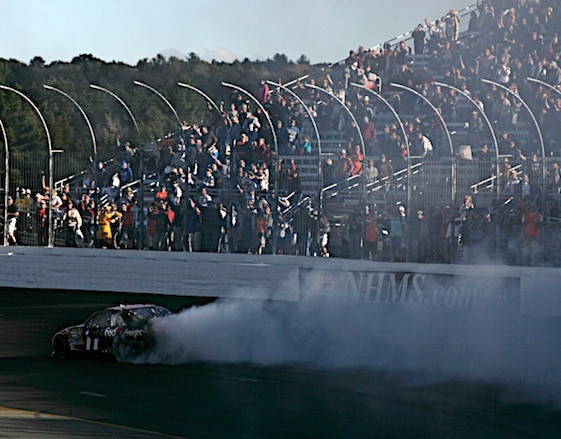 Racin’ Today » Hamlin Delivers In New Hampshire; As Promised? 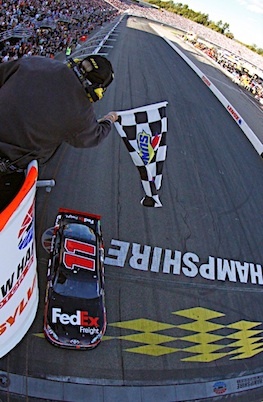 Hamlin Delivers In New Hampshire; As Promised? 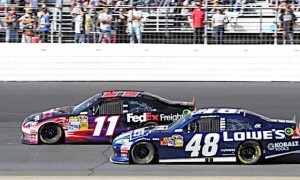 LOUDON, N.H. – The debate over Denny Hamlin calling his shot or not at New Hampshire Motor Speedway can now begin. Whichever side you take, Hamlin walks away with a dominating win. After he ran out of fuel on the final lap a week earlier at Chicagoland Speedway, costing himself and his team valuable points in NASCAR’s Chase for the Sprint Cup championship, a disappointed Hamlin tweeted that he was going to win this week at the Loudon track. Some people deemed that a guarantee that he would take the victory on the “Magic Mile.’’ Hamlin said it was not a guarantee, but simply a show of confidence. 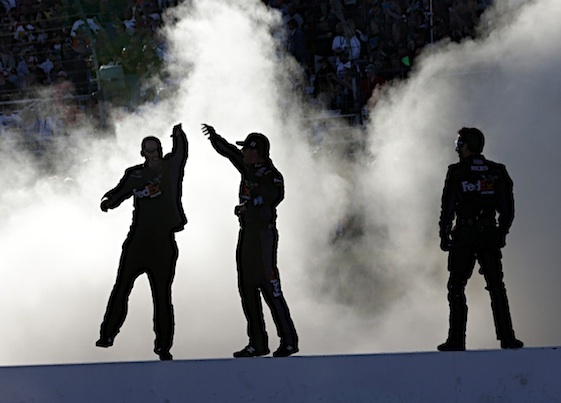 But, after running away with the win in Sunday’s Sylvania 300, Hamlin crawled out of his No. 11 Joe Gibbs Racing Toyota and made like Babe Ruth in 1932 when he called his shot before hitting a World Series home run in Chicago. Hamlin, who led 193 of the 300 laps, including 193 of the last 206, pointed to the distance and then took an imaginary swing with an imaginary bat, obviously referring to the called shot. Asked why he waffled on predicting a win this week, Hamlin said, “I just wanted to clarify that there are no guarantees. I’ve had the fastest car in my career and not won _ 20 times, some crazy amount, and not won because of the variables that I talked about on Friday. After a mixup by his team on setting tire pressures for qualifying on Friday, Hamlin relegated to starting 32nd in the 43-car field. Hamlin said before the race he wanted to be in the top 10 by lap 100. Instead, he effortlessly sliced through traffic, moving to the lead on lap 94. From there to the end, there was little question who would win. Jimmie Johnson, who was the runner-up for the second straight week, also had a fast car. Just not fast enough. Five-time NASCAR Sprint Cup champion Johnson had one last shot at Hamlin after a debris caution late in the race. But Hamlin easily pulled away on the restart on lap 278 and wound up winning by nearly 3 seconds – about 10 car-lengths. Still, Johnson moved into the lead in the Chase for the championship, one point in front of Brad Keselowski, who finished sixth. Hamlin is third, seven points behind after the second of 10 Chase races. The driver who has won the second race of the Chase has also won the title each of the past three years. Jeff Gordon finished third, followed by Clint Bowyer and July New Hampshire winner Kasey Kahne. Reigning Cup champion Tony Stewart finished seventh and fell to fourth in the championship, trailing Johnson by 10 points. It was Hamlin’s fifth win of the season, the 22nd of his career and the 100th Cup win for JGR. The win was sweet vindication for Hamlin, who led 150 of 301 laps but finished second here in July after Grubb made a bad call on his final pit stop that day. Hamlin came into the pits in the lead, but Grubb chose to change four tires while all the other contenders were changing two. The driver came out of the pits in 16th place and a furious charge toward the front over the last 61 laps came up just short. But that run did prove to Hamlin that he could get through traffic on the one-mile oval where passing is generally considered difficult. Starting deep in the field Sunday proved no obstacle at all. The 12 drivers in the Chase all finished in the top 18, with Kevin Harvick 11th, Dale Earnhardt Jr. 13th, Matt Kenseth 14th, Martin Truex 17th and Greg Biffle 18th. Gordon, who had a disastrous day at Chicagoland when he crashed late in the race while running in fourth place, came back with a strong effort on Sunday. But he still finished the day 12th in the standings, 45 points behind Hendrick Motorsports teammate Johnson. With eight races to go, Gordon knows getting back into contention is a real uphill climb. But the third-place finish on Sunday gave him and his No. 24 team a boost.